This colorful hat was knit by Christina the yarn she used is Hobby Lobby Sweet Delight Baby & she got the pattern from her LYS Yarn Explosion.. These two hats were knit by Debbie. 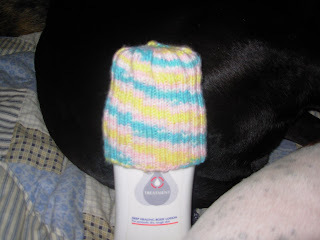 The pink one is made from Caron Simply Soft & the blue one is made from Red Heart Soft Baby Steps . 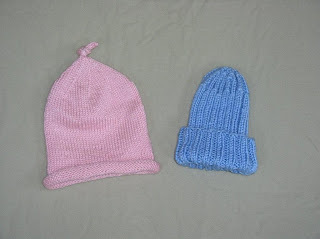 You can find the pattern for the pink hat here & the pattern for the blue hat here. 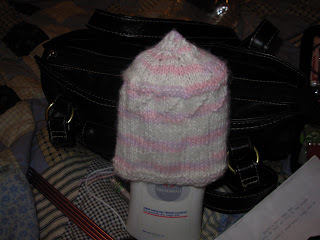 Christina also knitting up this pink & white hat using Bernat Softee Baby . You can find the pattern here. Thank you for taking the time to stop by & read about what we are trying to do for the residents of The Yurok Tribe on the The Yurok Reservation. I am going to try & answer some of your question here in this post but please feel free to email us at knittingforhope@gmail.com. 1. The tribe colors are red & black but all colors are appreciated. 2. Please make sure the yarn you use is washable. 4. They are in need of hats & scarves for adults/kids & hats for babies. 5. If you are worried about the cost of shipping you can order flat rate shipping boxes from the post office & send them out that way. 6. If you decide to knit something please email us a picture so we can post it here love to see your work. You can mail them to the address below they will be delivered to Debbie's mom & distributed out to everyone.